Not all assets are created equal. We know that physical assets degrade over time. As assets deteriorate, operation and maintenance costs increase, and customers experience negative impacts. At some point, all municipalities and utilities must analyze the financial impacts of additional maintenance or replacement. However, not all failure is created equal, either. Some assets may be highly critical to a system’s operation, while others are not. Certain types of assets may be critical in one system location but not in another. Each system must carefully examine its own assets to determine which are critical and why. To effectively manage the complexity of public infrastructure and assets, GIS must be at the heart of the data collection solution. GIS-centric technology serves as the system of record for risk-based assessments. Basic data identifiers—such as asset attributes, location, age, condition assessments, failure history and more—provide valuable information for calculating risk. That’s where Cityworks Operational Insights comes in. Using data from Cityworks and ArcGIS, Insights helps build risk model strategies for asset management. This system of insight allows cities to determine how to prioritize maintenance dollars and capital expenditures. In order to determine asset criticality, two questions must be asked: What is the likelihood the asset will fail? What are the consequences if the asset fails? These questions establish two important asset valuations: the probability of failure (POF) and the consequence of failure (COF). Together, these factors can help you rank your assets and create meaningful arguments for capital improvement. 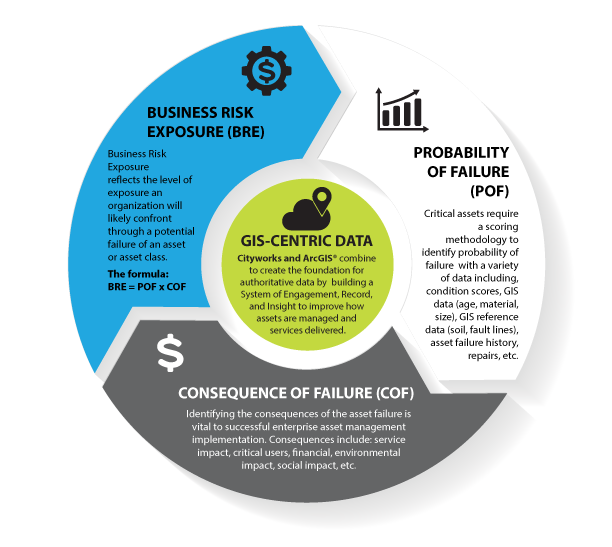 The probability of failure reflects an asset’s GIS attributes and considers ways in which the asset might fail. For example, a pipe system could be divided into pipe segments. The performance parameters for each pipe segment might include structural condition, maintenance condition, material type, and hydraulic capacity. These parameters can be weighted based on the input, and the probability of failure factors can be assigned a scoring scale of 1 to 5. Major users – impact of service interruption for hospitals, school, and industries. Community and environmental impact – costs associated with community health, safety, and perception, as well as environmental protection requirements. Service area – impact associated with service interruption throughout the city as the service area increases. Critical crossings – construction issues associated with replacing or installing a relief line at critical crossings such as utilities, waterways, railroads, and major thoroughfares. The assessment of these consequences can also be assigned a scoring scale of 1 to 5. Once you’ve calculated the POF and COF for each asset, you can determine the product of the two. This calculated value represents the business risk of failure for each asset. In the image at the top of this page, critical and high-risk assets are represented in red. Using the 25-point matrix, an organization can set its own priority levels and color coding. The results can be used to develop an overall system improvement plan, as well as a prioritized list for targeted maintenance programs. It’s important to periodically review the criticality analysis and make adjustments to account for changes in the POF and COF. Costs may go up over time, or a community may experience new growth. If an old asset fails and is replaced with a new asset, its criticality number will decrease now that the new probability of failure is much less. A GIS-centric system for public asset management relies on Esri’s ArcGIS® geodatabase as the asset repository and Cityworks as the system of record for asset management, maintenance, and risk. As organizations use Cityworks and ArcGIS to collect new and better data, they can perform increasingly accurate risk analyses. Together, Cityworks and ArcGIS offer a platform that provides greater insight into effective operation and maintenance strategies—improving decision-making to better balance risk and cost.